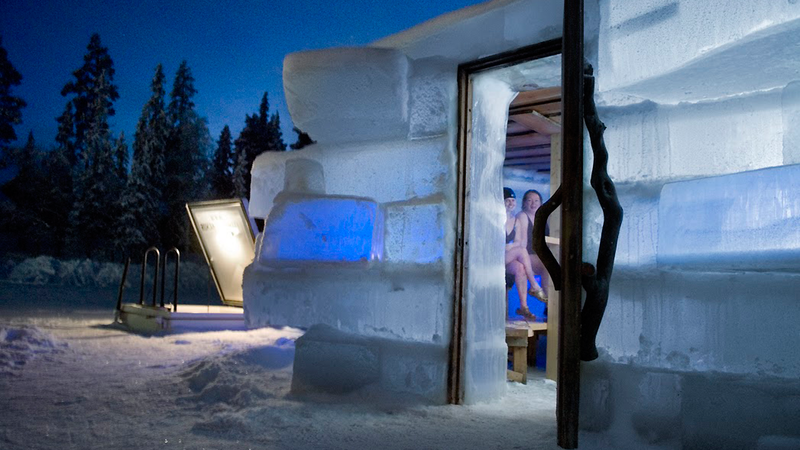 Could this be the quirkiest sauna in northern Finland? Finnish saunas are renowned for relaxing the mind and muscles, but Kuusamo-based hospitality and sauna operator Rukan Salonki takes the experience to the next level with their ice sauna. Their slush-insulated hut is made of ice cubes from a nearby lake, and inside visitors are welcomed by a gentle steam in 60 degrees Celsius. This seasonal curiosity is popular for its quirkiness, but few are aware of the ice sauna’s lesser-known health benefits. “As the humidity percentage is over 80, many people with lung problems find they can bathe comfortably even if they can’t stand a regular sauna,” says sauna therapist Marjo Määttä of Rukan Salonki. The steam is softer and wetter than in a regular sauna where the temperature typically rises to a sizzling 80 degrees Celsius. You begin to perspire the moment you enter, which helps beat seasonal colds and flu, explains Määttä. It has taken Rukan Salonki 16 years to perfect the technique of building the low, box-like sauna, which fits ten people at a time. The season usually lasts from December until the sauna begins to melt early in April. This article is published in the February 2016 issue of Blue Wings.